Ann Carlson will be giving a free talk about her work on Tuesday September 1, at 5:15 in Nevins! A MUST SEE. Later in the week, get yourself to nevermoor farm in Andover to see her wonderful work. Read about it below. Recent Doris Duke Artist awardee, artist and choreographer Ann Carlson will conduct a three-week residency/seminar beginning August 15 at Alfred University in Alfred, New York. 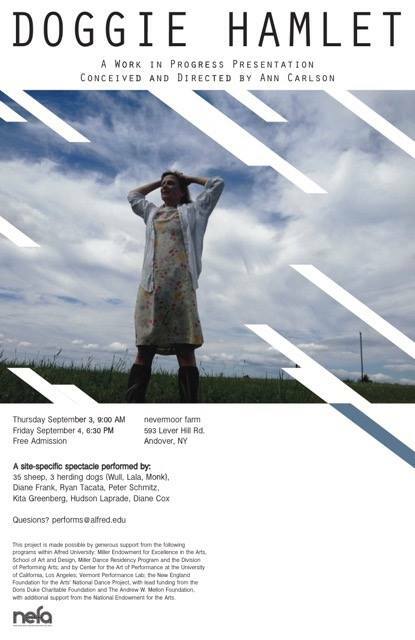 This collaborative residency with Alfred University students, scholars, and faculty will culminate in two work-in-progress showings of Carlson’s newest performance work, “Doggie Hamlet,” on Thursday and Friday, September 3 & 4, 2015 at the nevermoor farm in Andover, NY. Approximately one hour in length, “Doggie Hamlet” takes place in a lush green meadow and is performed by four (human) performers, an American Sign Language interpreter, three herding dogs, and a flock of sheep. This interdisciplinary work combines contemporary dance, classic narrative structure, and elements from competitive sheep herding trials. “Doggie Hamlet” mines the territory of human and non-human relationship, delves into the hierarchy of domestication and wildness, and explores instinct, memory, family, and loss. The New York Times said, “Ann Carlson is a conceptual artist who uses gesture, text, and humor to break your heart.” “Carlson’s work mines the ephemeral and the commonplace towards extraordinary results,” stated Robin Wander of the Stanford News. See Ann Carlson’s piece Doggie Hamlet this week!